2) For the backspace issue, there is a simple fix. Please SSH to your phone or run term-vt100 directly on the phone and create a file “.profile” (without double quotes) in the /var/root directory. Simply put these two lines in and restart term-vt100 and you are good to go. A long afternoon of iPhone frustration. Well, I have also had an evening of frustration. I’m trying to downgrade my Installer to 3.0b8, since I too was a victim of a broken 3.0b10. 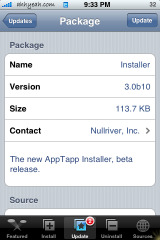 Everything was runnig fine, until I tried to copy the older Installer.app over to the iPod. It kept giving me errors, and wouldn’t copy the entire folder over. So then I tried it file by file. 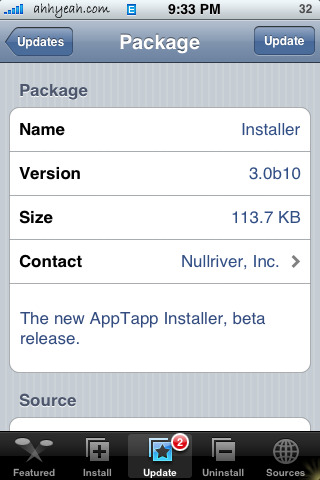 I figured out that it was the actual script (the file inside “Installer.app” actually named “Installer”). The other file that wouldn’t go over was the OTHER executable named “AppTapp”. Whenever I tried these files, it kept saying that there was problems with the permissions. I am running Windows, so I went to my OS X machine and tried chmod there. Took it back, still no luck. I booted into LINUX, and tried it THERE. STILL no luck! I have tried everything I can think of, but I cannot get those files onto my iPod! I don’t know what else to do. Ugh. Does anyone have any suggestions? Please?? what does this mean and what do i do!! It was working fine downloading apps then all of a sudden I tried to reinstall bsd subsystem and now it won’t download the app and says “error: package download failed” I tried to download any other apps and now it won’t work. I tried to remove que then reinstall then it would download 2/3 then says the same error message. 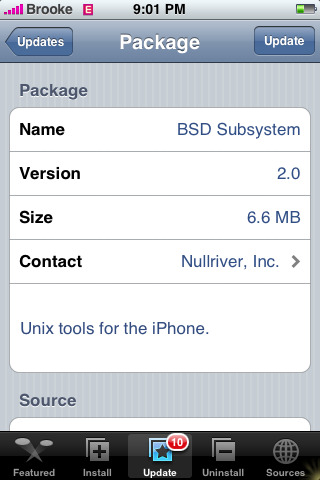 I also updated the source for repo.smxy.org/iphone-apps/ and it still wouldn’t work. Somebody please help me! this is driving me crazy!! I noticed BSD wouldn’t download the other day also. Anyone else having trouble downloading BSD? I cannot seem to be able to reinstall Bsd Subsystem either. is there some pre-requiste for it? I would really appreciate any help hat can be provided. I have same BSD subsystem error. I can install uninstall all the app except BSD. “Download error”. I used ziphone to upgrade from 1.1.3 to 1.1.4. I refresh , install Community sources but BSD is die hard to reinstall. 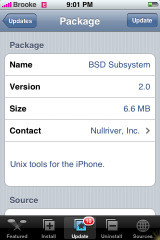 Atleast can someone post to manually uninstall BSD subsystem because I SSH fine on my iphone. okay i got my touch a few weeks ago and every time i try to download bsd subsystem it says error package download failed. ive tried rebooting the touch, waiting a little bit, refreshing my sources and nothing works! I’m having the exact same problem here…. First off, I couldn’t get ApolloIM to work so I was told to reinstall the BSD Subsystem and now I cannot reinstall the BSD Subsystem. i have the BigBoss Apps and Things source but it still doesnt appear to be there. do i need bsd subsystem if i running in 2.2 or 2.1 os??? and where i can find it? ?